Mary Lou Gravatt said "While waiting for the hang out to start I did a search in MyHeritage.com books. The first 3 were about my husband's 3rd great grandfather one show him on a list from Castle Garden dated Oct. 30, 1850." BRAVO! Ol' Myrt here just loves it when people tell us about their genealogy breakthroughs. Cheri Hudson Passey said "Been thinking about starting a Carolina/Southern Bloggers get together! Anyone interested, let me know!" Danine Cozzens said "Good to know about PrintFriendly.com since Evernote is discontinuing support for Clearly, which I use a lot to avoid web page clutter." Randy Seaver shows step-by-step how he browses Ancestry.com's US Probate collection. And Kathleen Moore reports this info helped with her Maryland wills research at Ancestry. Bill West reports "I had a West family cousin contact me through my blog last week. Her 2x great grandmother was my 2x great grandfather's sister." 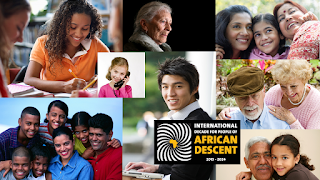 Decade for People of African Descent logo from the United Nations. Seems we were busy today talking about national cemeteries in the US for former military servicemen and women. Ancestry has the US Headstone applications for Military Veterans 1925-1963. Unlike the UK, in the US, anyone who has faithfully served may be buried in a national cemetery. Attendees cited examples where spouses and children were also buried with the service person. On the subject of cemeteries, our man in Ireland, Tony Proctor, writes "I had a breakthrough yesterday. For long time, I had failed to find where certain ancestors were buried. None of the online sites had any information on them. The parish register transcriptions from the relevant family history society had others, but not them. I then started using http://www.deceasedonline.co.uk/ and there they were, in a cemetery that was privately run during 19th Century. No idea why it wasn't in those transcriptions. Now have details of others in same plot, and scans of relevant burial register pages. Now trying to find out the typical cost in this cemetery and it may help establish how wealthy the family was." Sheri Finley shows us the bottom of the dresser drawer she spoke of last week. You'll find it in her blog post titled "A Most Unusual Genealogical Record." to log in so you can read all the comments posted before, during and after the live hangouts.